The Bundesliga's leading scorer, Bayern Munich's Robert Lewandowski, spearheads a potent Team of the Week. 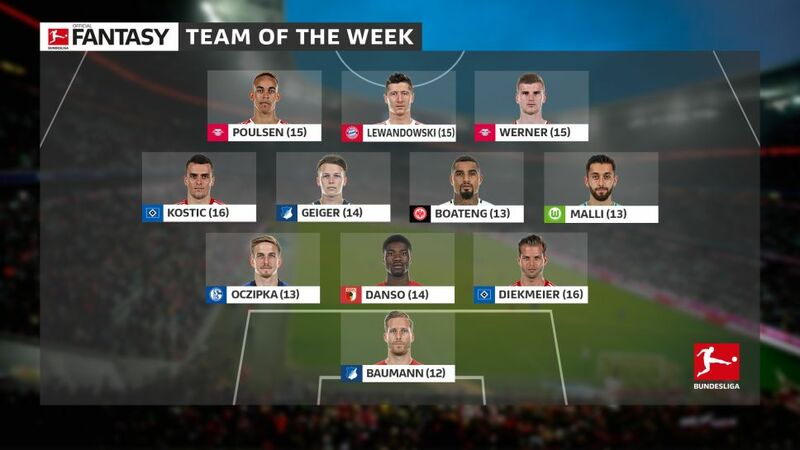 Bayern Munich's Robert Lewandowski is joined by RB Leipzig's up-and-at-'em front duo Timo Werner and Yussuf Poulsen in a formidable bundesliga.com Matchday 11 Team of the Week bristling with firepower. A man-mountain of a defender, the young Austrian's first Bundesliga goal provided a satisfying dollop of six points in his total, as did his ability to put his 6'2" frame to good use in the Augsburg engine room all the while without committing a single foul. A modern-day full-back needs to produce at both ends of the pitch, and Oczipka did so: he teed up a game-high four shots for the Royal Blues as well as winning over half his 22 challenges, a combative streak that brought six of his points tally. The artful midfielder would have hoped his first goal of the season would translate into a victory for his club, but while he had to settle for a point, his strike earned you Fantasy Managers four. A game-high five shots helped boost your returns. This was not a royal command performance from Frankfurt's aristocratic midfielder. It was more one in which he rolled up his sleeves, battling his way to eight points for 'won duels' thanks to his 21 successful challenges, and inspiring his side to a win with industry. The 19-year-old midfielder showed that, despite his age, Julian Nagelsmann can count on him. Geiger radiated maturity beyond his years in Cologne in what was only his ninth Bundesliga game, sending the Billy Goats into meltdown with his second career league goal. Involved in half of his team's 20 shots in a busy 90 minutes at the Volksparkstadion, the Hamburg man pinged over a game-high seven crosses, and if that wasn't enough, he also put his team 2-1 up. If you still want more, you're Felix Magath! The fledgling Germany international polished up his blossoming reputation — as if it needed it — with a performance straight out of the Lewandowski mould. A goal and an assist would have been embellished by another goal had he found the net not the woodwork. He may have been a touch late for Halloween, but Lewandowski again returned to haunt his former club Borussia Dortmund in Der Klassiker. 'Bullied' is perhaps more appropriate as the world's most complete striker turned in another all-round display: involved in seven of Bayern's ten goal attempts, he also got stuck into a bruising 31 challenges and netted his 11th goal of the league campaign. The Denmark international did his 'day job' with a goal, but his tigerish qualities also shone through. The in-your-face muscle to Timo Werner's fleet-footed stealth, Poulsen won a team-high 21 challenges to leave Hannover feeling bruised and battered in more than one sense. Click here for more Bundesliga news and features!